Do you hear a voice that says your work is never good enough? Learn how to know when you have done enough and can relax. Is it hard for you to get started on projects because it feels like your work will be no good? Work through this fear so you can initiate work with ease. Does your Inner Critic judge you for not producing high enough quality work? Create an Inner Champion that recognizes the excellence of your work. Do you always have to do more to get something perfect? Learn to relax and not sweat the small stuff. Are you concerned that your family, home, or appearance must be impeccable? Work through these fears so you can be loose and free, knowing that you are OK as you are. Are you often late with projects because you can’t stop working on them? Learn when enough is enough. Do you get obsessive about getting all the details right? Work through your fears so you can realize that you are OK without being perfect. Do you spend way too much time working and have little time for fun, relaxation, and family? Gain the perspective to see what is important in life. 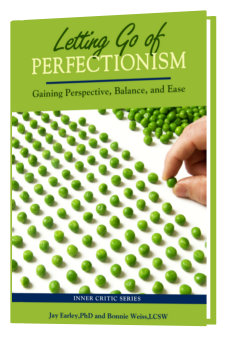 You will learn about the different types of Perfectionism, the fears that drive them, and the childhood wounds behind them. You will learn how to work through your fears, identify the perspective of ease and balance you want to develop instead of Perfectionism, and engage in a life practice to adopt it.